The remit of the Pet Animals Act ends at the doors of the licensed pet shop. This is a huge problem because pet shops do not exist in isolation, they are part of a much bigger supply chain which includes breeders and transporters. If conditions at vending premises were immaculate and every attention was paid to environmental enrichment, the current legislation would still not ‘protect the welfare of animals sold as pets’ because it does not ensure animals are bred, reared and transported responsibly prior to their arrival at the premises. Other pieces of legislation are supposed to cover breeding and transport but they are also inadequate, un-enforced or contradictory. Animals destined for pet shops are simply commodities, frequently bred en masse in commercial facilities, transported with minimal regard for any requirement other than they reach the vendor alive and 'stocked' until they are sold to the first buyer that presents with cash and interest. There are no provisions for restricting sales other than to children, so pet shops have no obligation to establish the suitability of potential owners. Breeding animals are regarded as little more than production units. Out of public sight and with no need to protect their sale potential, even their basic physical needs are barely met. Regulations covering commercial animal transport pay only cursory attention to the wellbeing of pet animals compared against the detailed requirements for the transport of farm animals. It is a peculiar state of affairs where animals destined for the food chain have more consideration for their welfare than those intended to be treasured companions! What exactly is a pet shop anyway? This was a commendable addition to the Pet Animals Act in 1983 and restricted the sale of pets to buildings, but that has led to yet another problem with the legislation, for what exactly is a pet shop? The Pet Animals Act covers any premises where pet animals are sold in the course of a business, including ‘private dwellings’. The development of the internet has provided sellers with an almost unlimited potential to advertise their wares and this has led to a situation where pet shop licences cover all manner of different locations including farm buildings, garden centres, residential properties, pet superstores as well as the traditionally held concept of a high street pet shop. It appears that because almost any premise can be licensed, local authorities and enforcement agencies now cannot see the wood for the trees. There are a great many unlicensed sellers, purchasing animals from breeders, other third parties and even posing as animal rescues. They advertise through the internet and masquerade as genuine breeders either through deliberate intent to mislead or through careful omission of the facts. The degree to which the Government is relying on voluntary action to tackle these problems is extremely concerning – especially as this is a consumer protection as well as an animal welfare issue. The Pet Advertising Advisory Group (PAAG) minimum standards may have resulted in a slight reduction in the number of inappropriate advertisements. However there are certainly advertisements even on the select few websites that have signed up to PAAG’s voluntary code that are in clear breach of the standards. Repeated advertising by frequent sellers with pet shop licenses is often overlooked, yet the public are supposed to place their trust in these measures to protect them from unscrupulous advertisers. Criticism of the sale of puppies through pet shops is frequently deflected by citing that there are worse problems associated with online advertising and illegal imports from Europe -but these are directly associated with the Pet Animals Act! 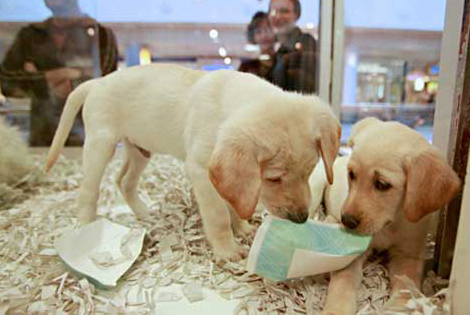 Many ‘pet shops’ advertise openly or covertly online and there is no legal outlet for any puppies imported into the UK except through a licensed pet shop. The latter issue would show almost instantaneous improvement if no lawful market existed, but oddly this is almost entirely overlooked to the point where it appears that very few really understand the workings and implications of the current laws. Is the Pet Animals Act 1951 working? Despite the Government’s persistent assurance that the Pet Animals Act is working, there is ample evidence to show that it is catastrophically inadequate to ensure the welfare of animals that pass through the 'pet shop' chain. At sixty-four years old, the Pet Animals Act is fast approaching state retirement age and is feeling the strain of a burden which it is woefully inadequate to deal with. Even those that cherish it most – the pet trade industry, are largely in agreement that it is not functioning as it needs to – and that speaks volumes. It is most certainly unfit for purpose and is failing animals from fish to primates. It probably is 'working' though - because its demands are so few, its wording so subjective, its interpretation so wide that it is almost impossible for any licensed pet shop not to meet the conditions. They are therefore licenced and regulated to the satisfaction of DEFRA, despite numerous complaints from customers, investigations, malpractice and most reprehensible of all - the ongoing poor health, stress and frequent fatalities suffered by the unfortunate animals that pass through them. Undoubtedly there are some pet shops that do everything in their capacity to ensure the welfare of their animals by consciously exceeding the requirements of the Act and licence conditions. It may seem unfair to tar these vendors with the same brush applied to the worst examples of the trade – but ultimately has the time come to question whether it is appropriate to treat companion animals (or at least vertebrates) as simply commodities? The ‘live pet trade’ is supposed to reflect the nation’s love of animals and desire for companions to enrich our lives but in reality it often results in extensive, prolonged suffering and misery. Make no mistake, this industry is not about a love of animals, it is as much about intensive animal production as farming animals for food.